Did you get engaged over the holiday? The merry season is also the season for popping the big question, as one in four eager grooms propose to their brides during this time of year. It seems that most couples don’t put off planning their big day as Brava! gets a rush of catering requests just after the NYE party gets cleaned up and hangovers subside. I stress events here, as most weddings are never only about the big day. Brava! receives all types of requests for catering not just the wedding, but also wedding showers, rehearsal dinners and most recent, the wedding after party. 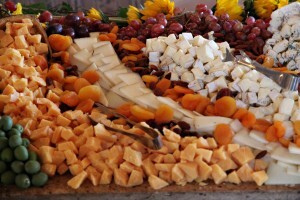 Our unique style of catering and offerings fits all the above events. 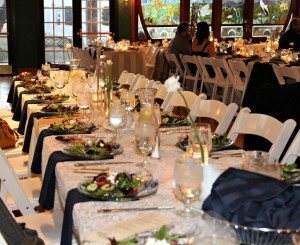 We can do casual for your rehearsal and after party, or take it elevated for the big day. 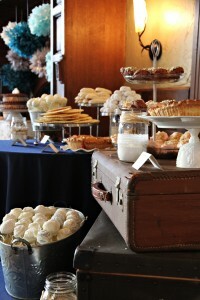 Our diverse menu and service offerings of buffet, cocktail stations and family style are classic and can fit any budget. A wedding, your big day, is an important, memorable and personal event, we take it very serious. Brava! has over ten years of combined catering experience. We will set up a consultation / tasting while we explain our wide range of services, from packages to custom full service, and talk about your vision for your day. Contact us today by filling out our catering request form. We will send you our catering menu and set up a free consultation. Graduation season is just around the corner, have you considered catering options for that special day? With graduation season just around the corner, the Brava! hotline has been ringing off the hook and we are in full swing booking catering for graduation, birthdays and weddings. 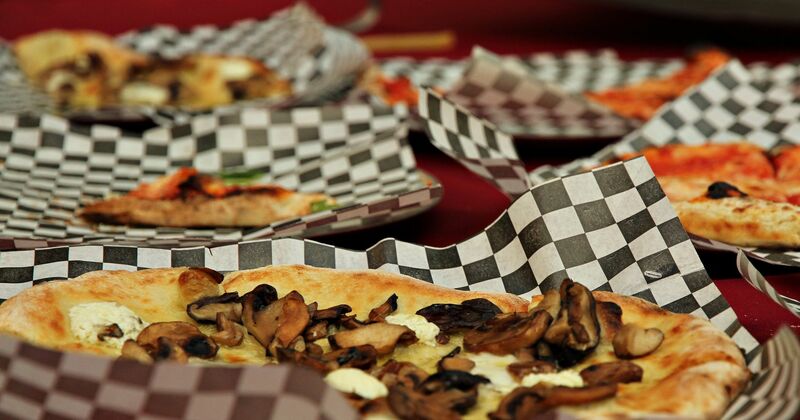 Treat the grad, friends and family to one of our pizza catering packages. 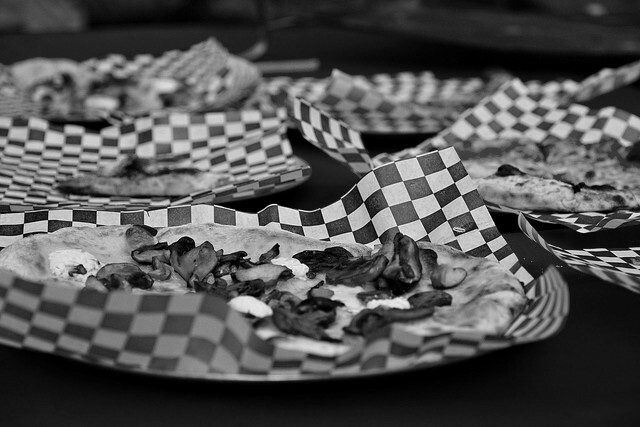 Whether it’s pizza only or you prefer the whole spread, we have just the right pizza-catering package for you. 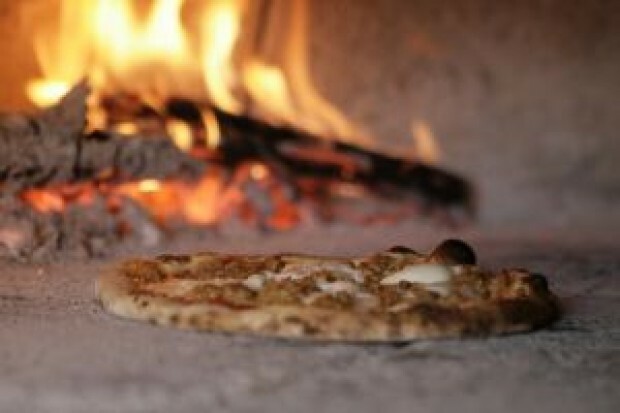 We will park our mobile wood-fired oven in your driveway, yard or any event space and make fresh wood-fired pizza for you and your guests. Whether you are looking for a casual backyard affair or a formal celebration Brava!’s catering experience ensures we have the knowledge of what you need to throw an incredible, memorable party without lifting a finger. Give us a call or email to request a catering menu. Just over five years ago I decided my life needed a change of scenery. From my very secure and predictable desk job at an aviation company on a fateful day I drafted up a resignation letter, dated, signed then delivered it to my unsuspecting manager. I can still see the look on his face, which alone was enough for me to have ditched the job. Three months later I’m sitting in coach seat on my way to the Mother Land (a good portion of my family hails from southern Italy) for my 9 month culinary journey. It was a bit crazy, I didn’t really have a plan – other than the contact I had made at small farm in the Tuscan country side, trading my labor for a room and rustic country food. From there I made other contacts and soon found myself working in the kitchen of small family-run trattoria in a charming village in the south of Tuscany, not far from Lazio. It was here, Trattoria Taverna Etrusca that I learned to cook with fire. Which brings me to pizza. The chef from whom I was learning hailed from the south of Italy, in the Campania region – known specifically as the birthplace of pizza. Dominico bestowed on me the virtues, the art of pizza making and his cherished dough recipe for pizza. When I think back to when I first conceived of living in Italy – little did I know that I would end up owning a pizzeria. You will learn how to make authentic, Napolitan style wood fired pizza at the Cook Street school of Culinary Arts from the ground up. 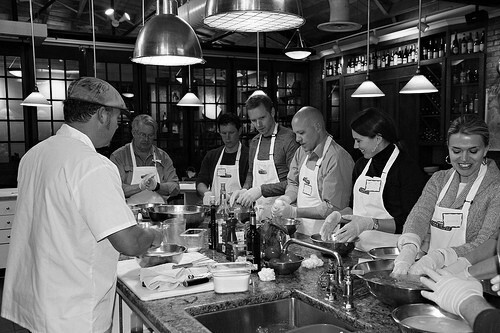 The class includes learning how to make pizza dough, hand stretch mozzarella, hand stretching pizza dough, topping and finally baking your pizza in the wood-fired oven. If you’ve ever wanted to own a wood fired oven – or if you are just a pizza freak – this is the class for you! Welcome to the new Brava! web site and the Brava! blog “The Zen of Zaa”. Second to making bellisimo pizza a mano (very beautiful hand made pizza) is our pleasure of personally connecting with our community, YOU, daily. 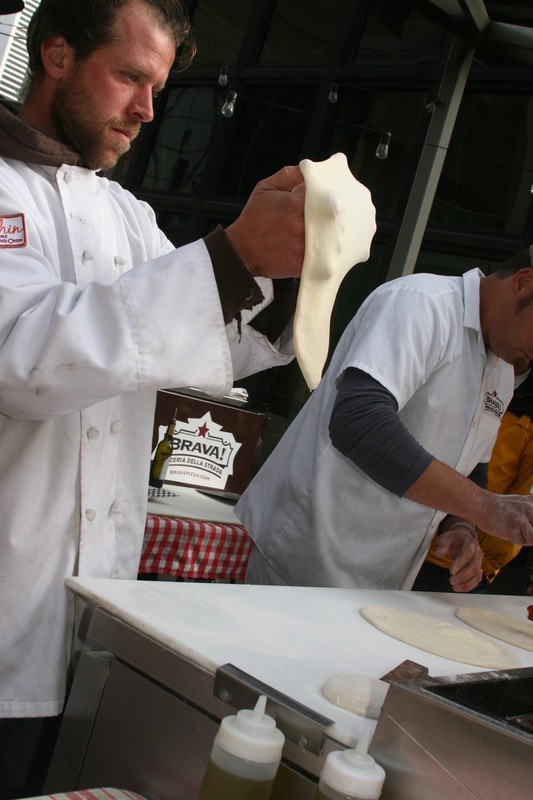 I get a kick out of chatting it up with Brava!’s faithful as their pies are making their quick but careful transformation from raw dough to a hot pie out of the oven. To that extent, our new web site allows us, through various channels, to have an open exchange with you, be it blogs, video blogs or the myriad of social networks; just like we’re right there on the street. The only thing missing is the zaa. To us, food should be a pleasure experienced and enjoyed in the company and the conversation of others, made out in the open fostering honesty and integrity. Food is more than fuel for the body – it is an extension and certainly an expression of the person behind its creation and to those enjoying its flavors and textures. Food is communion, in a very social sense separated from the religious connotation of the same word. It is a connector, the most basic and common form of relating – bridging both friend and foe. Brava! 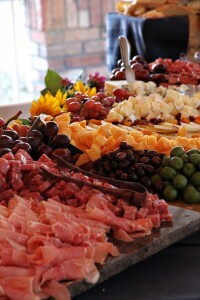 Caters Your Office Functions! Got a meeting, a working lunch, office shin-dig or just want to treat your office peeps to a job well done? Look no further than Brava! 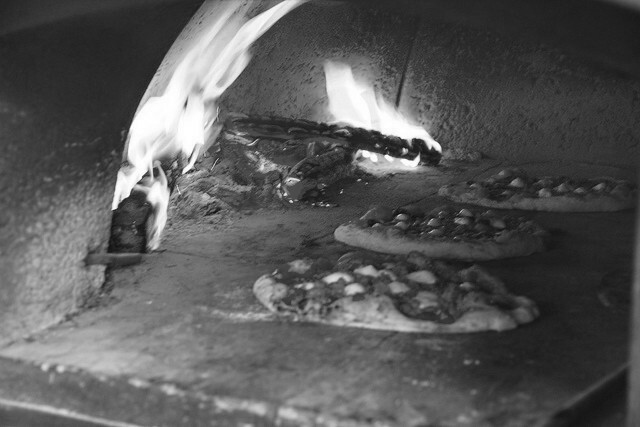 to deliver our delicious, wood-fired pizza to your office. If your office is located within three blocks of the D&F clock tower on 16th and Arapahoe Brava! 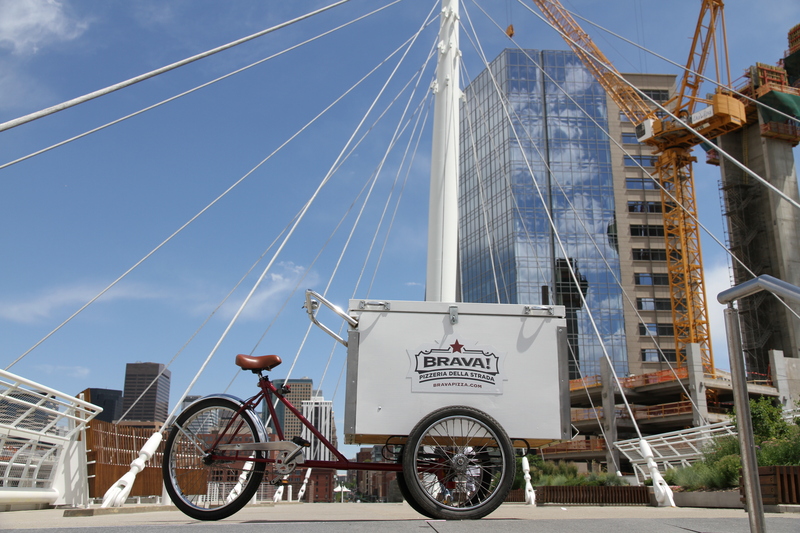 will deliver pizza, salad and beverages to your next office function. Just call us at 720.446.8176 and have an order in by 5pm the day before and we will deliver by noon. Colorado is by and far one of the greatest places to celebrate that special day. Whether you are planning your big day up in one of Colorado’s award winning resort towns, the beautiful foothills or right in the heart of the city, Brava!’s award winning pizza paired with our seasoned catering services will ensure you’re day is most memorable. Let our professional and knowledgeable catering staff help make your wedding day one to remember. We understand that the caterer you choose is one of the biggest decisions you are faced with, and our goal is to provide an easy stress free experience so you can relax and enjoy your big day. Though you have many options to choose from, how many will give you the personal attention that you deserve? We take the time to understand your vision and will work with you one on one to create an experience you and your guests will never forget. 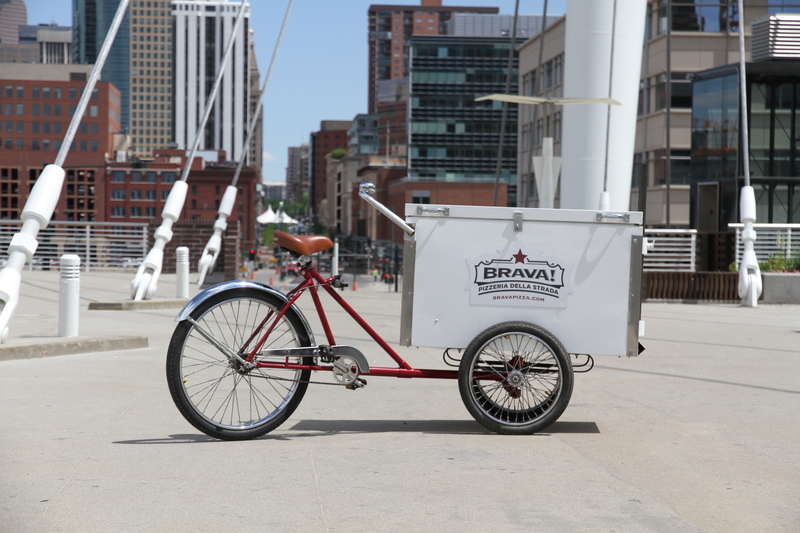 Unlike a traditional caterer, Brava! 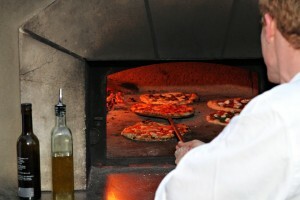 prepares and cooks our cuisine right in front of your guests, in the warm and inviting fire of our wood-fired ovens. Whether you have 30 guests or more than 250 guests, our professional and pleasant staff has a wide range of catering experience from engagement parties to rehearsal dinners and wedding receptions. What makes Brava! unique is we can help you through the entire day, whether you simply want our award winning Italian cuisine or would prefer us handle it all, from set up to break down, we will do as much or as little as you need. We are here to help and the best part is you can schedule a free catering consultation with our extraordinary team that will take the time to get to know and understand your wedding catering needs. If you have any questions or would like to know more about our available options please contact us! The single most important component of the pie, the pizza crust, is the foundation of the pizza itself. Not to mention the obvious, the pizza crust is the vehicle for which the carefully selected and paired toppings are thoughtfully spread, baked, served and finally consumed. As it is important to the whole pie, the pizza crust must take on, so to speak, the role of the supporting actor, be every bit as good, but never over shadow the lead of the toppings. There becomes a delicate balance the crust must take on, to have a character all its own that will, in the end, complement and even bring forward the toppings that adorn it. A great wood-fired pizza crust should have slight char marks (flavor), bubbly on the ‘cornicione’ (the end crust) be thin in the center and have a crisp but tender and chewy texture. A sign of a hand stretched and prepared pizza crust is its non-symmetrical, almost dysfunctional shape, each pizza, like the snowflake, never the same shape or dimension. Before launching Brava! we knew the quality we wanted our pizza crust to exude. Getting there, achieving this end result that is the Brava! pizza crust, took several bags of test flour, hours of precise tinkering, sweat, some tears and over all determination. We arrived – and by all accounts our hard work has paid off. But getting to a great dough recipe does not guarantee the same success in the final product. To achieve consistency in the crust and ensure that every time you bite into a Brava! pizza it is always the same great experience, several factors and conditions must be managed precisely. You see, dough and more specifically, yeast is a living, breathing entity – it likes certain, most specific, conditions. If these conditions, for instance, temperature or humidity vary and not even widely, the dough will be all together different in many different ways. Now – consider that Brava! is for all intents and purposes an outdoor cafe and operating year-round in Colorado’s glorious, but schizophrenic, weather. Consistency is all but lost. We do not have the benefit of operating in a climate controlled space. We’ve thrown pizzas in all types of weather – below freezing, above three digits, wind, rain and snow. And, in each of these conditions we have successfully managed to keep our yeast happy and thriving, resulting in a pizza crust that is just the right balance of crisp to chewy texture with complementing char flavor. So, the next time you bite into a pizza, any pizza, pay particular attention to the crust. What impression is it leaving with you – because the crust is the true signature – the pure expression of the chef and pizzaiolo.